Considering the franchise goes back more than thirty years, The Legend of Zelda is not a huge commercial powerhouse for Nintendo, as the Mario and Pokémon franchises undoubtedly have been. Despite not kicking off until 2007, more than twenty years later, Ubisoft’s Assassin’s Creed franchise has racked up more total sales than Zelda has in its thirty year history, some 93 million to Zelda’s 85 million. The Zelda games, however, have been hugely influential throughout their long and chequered history, inspiring Legacy of Kain, Soul Reaver, Beyond: Good and Evil, Shadow of the Colossus, Okami, Darksiders, Binding of Isaac, Hyper Light Drifter and more besides. But the real influence of these games is not felt by those that borrowed its template wholesale, but in the way professional game designers constantly check the new Zelda releases for how it will shift the landscape of videogames – make no mistake, even now, games in production are having their directions altered as a result of Breath of the Wild’s critical and commercial success. This serial looks at key facets in the Zelda series, how they are used in Breath of the Wild, and the relationship this newest game has to the player practices and fictional worlds of its predecessors. My purpose is to try and reveal both the essential aspects of what makes Zelda what it is – and why that is so influential – and to apply the game design lineages method of historical analysis to Zelda in order to show how the conservation of player practices, the influence of material constraints, and the subversion of expectations through creator vision have all affected the path of this venerable franchise. Before looking at specific elements of the Zelda experience, however, it is necessary to put these games into a production perspective, by examining the circumstances outside the game that shaped the path of the series’ development. The franchise roots are in two highly successful NES games, The Legend of Zelda in 1986 and Zelda II: The Adventure of Link in 1987. Series creator Shigeru Miyamoto wanted the second title to feel distinct from the first, presumably in part because the technical limitations of the NES meant following the same style at that time would have resulted in a very derivative game. As a result, The Adventure of Link feels like the black sheep of the series and has had little influence on the play of future games in the franchise (it borrowed much from platform games and the newly-popular JRPG lineage, kicked off primarily by Dragon Quest), although it still contributed significantly to the still-developing lore that shapes the narrative space of each Zelda game. Conversely, the original Legend of Zelda not only provides the template for its 16-bit successor, A Link to the Past, released in 1991, but also for Breath of the Wild. Featuring what has come to be known as an open world, The Legend of Zelda was actually a little late to this party, since most of the key early open world games were released in 1984 and 1985. It also seems as if the ‘openness’ of the title might have been partly a consequence of the material constraints of the NES rather than express intention: Miyamoto-sans later Zelda games, A Link to the Past and Ocarina of Time, are much more locked down in their structure – a structure that had huge influence in the 3D combat and exploration games that followed. The Legend of Zelda’s 6.5 million unit sales (which were meteoric for 1986) were not surpassed until 1998’s The Ocarina of Time, which brought the core player practices of A Link to the Past kicking and screaming into polygonal 3D, selling 7.6 million units, and (along with Super Mario 64 and GoldenEye 007) making the Nintendo 64 into a hit console. Ocarina of Time also set world records for high review scores, although personally I do not like the game very much, apart from two elements – the titular ocarina, which was perfectly designed for the controller and taught the player some actual musical skills, and the horse Epona, about which I will have more to say later in this serial. This was the first Zelda game that future franchise mastermind Eiji Aonuma worked upon, and its direct sequel, Majora’s Mask in 2000, was the first time he was handed the reigns. Far too arcane for the mainstream, Majora’s Mask’s labyrinthine temporal structure and impressionistic ending mark it out as a creative masterpiece, and it is not surprising that Miyamoto-san felt comfortable passing the franchise onto Aonuma-san, while remaining a stalking presence in the production of every Zelda game since. The unique art style of Wind Waker has its own side-lineage in Zelda’s portable incarnations, Phantom Hourglass (2007) and Spirit Tracks (2009), which act as sequels. But the die was cast for the core of the franchise: the audience wanted a more realistic looking Link, and that is what they would get with 2006’s Twilight Princess, originally developed for the GameCube but then painfully reconfigured for the Wii. In the Hoggins retrospective, Aonuma-san only half-jokingly remarks that after the platform change his job was reduced to cheerleader: “From that time on, rather than actually making the game my job was to approach each staff member to convince them we could do it.” Twilight Princess was a success, setting a new high watermark for the franchise’s sales at 8.6 million units (1.6 million of which were on the ailing GameCube). This pattern was repeated two titles later with Breath of the Wild, which also launched on a troubled older platform (the struggling Wii U) as well as launching the new Switch, and by January 2018 the new game had sold an impressive 7.8 million (1.1 million of which had been on the Wii U). There was something that fans said before starting development that changed what I thought. There was a fan that said he really, really loved Zelda. But, while playing Skyward Sword, he missed experiencing this huge world where he could just ride Epona around. During Ocarina Of Time, he really loved doing that. Somewhere within myself, I felt the same way. So for Breath Of The Wild, it’s something that I definitely thought about. Actually, we did have in mind, from the start of development, that we wanted to create a large, wide, expansive world. And part of the reason for that comes from the feedback we got after Skyward Sword. The way that game world was set up was that you had kind of separate areas, separate strongholds, that you'd sort of land in and explore. But they were all self-contained, and they weren't really connected together. We listened to a lot of opinions, from people who played Skyward Sword. And a lot of people said to us how they found the game… Not exactly unsatisfying, but they wish they could have explored the areas between the strongholds. So taking that on board, from the very start of Breath of the Wild, we wanted to, and set out to, create a world that wasn't only vast, but where everything was connected. So you really could freely explore the world, without these barriers or gaps imposed. Skyward Sword was an outstanding example of the polygonal 3D Zelda form that Ocarina of Time had popularised, with improvements over Twilight Princess in almost every significant aspect, and substantial experiments in modifying the formula – including a much more explicitly constructed narrative. Link still did not say anything the player could hear, although for the first time we saw him talking to other characters (i.e. we saw Link’s lips move), and those other characters formed a much more coherent base for storytelling (helped by the single village, Skyloft, that served as hub). Review scores for Skyward Sword were incredibly positive, but the sales did not emerge on the back of it. It is possible that nothing could have lured gamers back to setting up their Wii at this point in time, and certainly not a game that relied upon newly improved motion controls. Speaking personally, however, playing with the butterfly net in Skyward Sword was a far more compelling experience of immersive presence than VR, which relies merely upon visual illusion and is not able to overcome the limitations in controls this entails. But whatever Skyward Sword’s merits, it hadn't been enough. It was time for Zelda to take a giant leap out of its comfort zone. In one of the few reviews of Breath of the Wild willing to take issue with its problems, Jed Pressgrove calls out a “dubious decision to draw inspiration from prototypical open-world games” seeing this as producing “a conflicted combination of marketing logic and staggering artistry.” This was, all in all, the only interesting review of the new game I’ve seen, since most have merely swooned over its ample pleasures. Jed’s review is the reason I’m writing this serial: there is indeed an aesthetic conflict within Breath of the Wild, as he alludes to, but I contend it is not the result of marketing interference (although don't get me wrong: this is a very tangible force at work in the videogame industry, and one that should never be ruled out prematurely). Jed’s only mistake is to see in Breath of the Wild problems brought about by borrowing from the open world genre lineage as codified by Grand Theft Auto III (having built upon firm foundations established by Elite back in 1984, right before the first Zelda). As I get closer to the retirement age, people ask me if I’m ever going to make anything other than a Zelda game. And so sometimes I think maybe I should. But Zelda games really have everything in them that I would want to make in a game. The way the main character grows and develops. The puzzles and the minigames. I don’t think there’s much point in me making something other than Zelda, if I did it would only end up being something just like it. It’s a problem. So I think I’ll just keep making Zelda games! Putting aside the billions of yen and hundreds of developers involved in making a contemporary Zelda game, at the core of this franchise – unlike any other that we know of – is the relationship of master to apprentice that has passed from Shigeru Miyamoto (age 65), to Eiji Aonuma (age 54), and is currently being passed along to Hidemaro Fujibayashi (age 45), who has worked on Zelda since 2001, firstly for Capcom on The Legend of Zelda: Oracle of Seasons and Oracle of Ages for the Game Boy Color before joining Nintendo, co-directing Phantom Hourglass, and then directing both Skyward Sword and Breath of the Wild. This is not how major commercial videogames are made, but it is how Zelda is made, and provides the reason that the franchise is primarily governed by the conservation of its own player practices, and the creative vision of a succession of apprentices that subverts these in subtle or radical ways in each iteration. Over the following weeks I’ll be examining individual facets of Breath of the Wild’s game design and narrative design, situating it in the unique – and insular – game design lineage of the Zelda franchise, and showing how the new game’s content emerges from the effects of a single additional constraint: the desire to transcend Skyward Sword’s functionally-isolated wilderness segments. The resulting serial endeavours to show how to understand Link as a character (and how Breath of the Wild’s Link is consistent with that character), why Hyrule is integral to this character, in part because of the way videogames necessarily represent player characters, how the horses are simultaneously one of the new Zelda’s greatest achievements and strangest failings, and why Breath of the Wild can lay better claim to the title ‘The Legend of Zelda’ than any game before it. A letter to students at ARCOS in Santiago, Chile. It came as some small surprise to me when, in a recent letter, your instructor Pablo Gorigoitia mentioned that Game Writing: Narrative Skills for Videogames was one of your course texts. This book, written with the IGDA Game Writing Special Interest Group and edited by myself, has been my most successful title by far, but I never really anticipated that it might be read as far away as Chile, some seven thousand miles away! To put this figure into perspective, we live nearly as far away from each other as the diameter of the planet we co-inhabit. I’d like to take this opportunity to share my thoughts as to why game narrative is important, and this requires that I first make clear the extent of game narrative as a field. For although it is not often recognized, no game that is made escapes from having narrative elements. The reason for this is that the play of all games generates exceptional narrative experiences, in part because humans are natural storytellers and construct our way in the world by means of narratives, and in part because play is one of our freest emotional expressions and thus inherently memorable. It is no coincidence that sporting events are used as stories-within-stories so often in blockbuster movies: the strong emotions generated by sports – both in its participants and its observers – make an outstanding (if occasionally lazy) scaffold for storytelling. We must, however, be clear to distinguish an explicit narrative – one that is placed into a game by a writer – and implicit narrative that emerges from the game as a system. I am interested in both these forms, and have made games that pursue both approaches (although the latter – systemic stories from games – is far harder, and usually more expensive to develop). Similarly, we ought to distinguish between diegetic stories that occur within the fictional world of the game, and non-diegetic stories that feature the player themselves as a character. “I won at Chess!” or “I got a Tetris!” are non-diegetic stories that are simply about the game being played, and are not really our principal interest when we study game narrative. That said, if you do not understand why players tell non-diegetic stories, you are at a disadvantage when it comes to understanding how to construct those stories that occur within the fictional worlds of games. At the moment, I teach a module on Game Narrative for the University of Bolton that I will soon also be teaching for Laguna College of Art and Design in California. One of my students at Bolton, James Drake, asked me over the Summer before he took that particular course what he could do to prepare for the Game Narrative module: I told him to read a book or a play. He was rather confused, and could not believe that I wasn’t directing him to play a game instead. But if you want to understand game narrative, you have to understand narrative, and that is a task best approached in media where it is far easier to construct. If you want to be a great game writer, you should begin by reading Charles Dickens, Jane Austen, and William Shakespeare – or indeed Eduardo Barrios and Isabel Allende. You’ll have to: we have very few great works of game narrative to refer to, so we must discover the standard of exceptional work in narrative from elsewhere. What makes game narrative so especially difficult is the player. A novelist or playwright can mostly count upon their characters to co-operate (although there are times when a story gets out of control…! ), but the moment we let a player into our story we have lost our sole authority over the narrative. As Street Fighter II puts the matter: “A Challenger Appears!” We now risk fighting the player for the flow of the story, or ruining their narrative experience by giving them no illusion of agency in how the events transpire. This is why it is far easier to mount a narrative on the backbone of something like Grand Theft Auto, where the player is presumed to be an anti-social ne’er-do-well (or rather, that they will act as such in the fictional world!). We can count on players to act badly. Counting on players to co-operate with our story is far more difficult, although not quite impossible. For a start, we can ask them to do so. I am of the opinion that if we want to make better videogames, we must study game narrative. This is because the experience of these kinds of games (indeed, all games at some level) involves entering into a fictional world, and if we do not understand the mechanics of such imaginary games we are severely limiting what we can achieve. But to understand game narrative, we must also understand narrative – and this requires us to pay attention to those media that have been experimenting with fictional worlds for millennia rather than just a few decades. This is why Game Writing commits a whole chapter to the basics of narrative theory, a field that goes all the way back to Aristotle, more than two thousand years ago. I encourage you all to wrestle with the fascinating questions of how to leverage the interesting qualities of videogames in the context of the established methods of narrative, precisely because we have not yet produced any unequivocal masterpieces of game narrative. Such future games as might attain to this title could come from anywhere in the world – they are as likely to come from Chile as from Europe and the United States, where commercial pressures make storytelling in games take rather humdrum and conventional paths, more influenced by Hollywood action movies than anything else. Who knows, someone in your very class could be the Pablo Naruda of videogame narrative, a digital poet, taking our youngest medium to new heights. PS: you are lucky to have Pablo as an instructor, so treat him kindly! And tell him he owes me a beer. I can sympathise with your position in Silent Hill 2: Horrible Survival, Not Survival Horror, in that many of your criticisms are justified. Nonetheless, I shall defend Silent Hill 2 as one of the few times that commercial videogames have dared to push into artistic directions, and I still cite it as a triumph of narrative design within an industry that seldom achieves anything memorable in this space. The key to appreciating Silent Hill 2, however, may well be to place it within its historical context. Indeed, I am not of the opinion that games can be appreciated as artefacts divorced from circumstance (nor films, novels, plays, or music, for that matter!). The artefactual reading of media is, I now claim, always the incomplete reading. I came to this game having been extremely impressed by the design of the original Silent Hill, which is more open, and cultivates a greater sense of freedom, than the sequel. However, Silent Hill is also a rather conservative game – it has its rather cleverly conceived setting to set it apart, but under the hood is a string of conventional puzzles punctuated with clunky combat. Nonetheless, at the time I was impressed with Silent Hill’s attempt to push beyond the rather limited ambitions of videogame experiences. It aspired to much, for all that it had problems delivering it. When my wife and I went on to play Silent Hill 2, it annoyed me with its obvious staged linearity and almost total absence of what I, at the time, considered characteristic of game design. Where was the open structure of the first game? The tightly constructed progression? Why am I so constrained in almost everything I do now? So it was with some surprise that, after a few more playthroughs and considerable reflection, Silent Hill 2 eventually came to stand out as an exceptional case of game narrative. Indeed, I am hard pressed to find any game prior to 2001 that fulfils its narrative ambitions to the extent of this game – which is not to say that it is an unqualified success on all fronts. But then, my general view of game narrative prior to 2001, when Silent Hill 2 was released, is rather negative. There are signs of what might be possible… but they are rare, and almost always dragged down by an overbearing emphasis on puzzles or combat. This is not the case for Silent Hill 2. For perhaps the first time in commercial videogame design (and I make a distinction here that you never do, in my experience), a development team took risks – serious risks, actually – to push their game away from the conventional expectations of the player community in order to explore a more artistic space. I will not argue that it is an unqualified success, but I believe what it does achieve has to be measured against its own contemporaries. This is the year of Grand Theft Auto III and Halo: Combat Evolved, videogames that take movies as inspiration and then… well, fail to reach narrative escape velocity, remaining parasitical on the original works. Silent Hill 2 builds upon the first game in ways that strengthen the originality of its premise; comparisons to Twin Peaks are tenuous: Kafka would be a more reasonable reference. Crucially, I would never claim that Silent Hill 2 was the epitome of the survival horror genre – it quite obviously went in a radically different direction from the mechanics that support this kind of play. I agree with the others commenting on your blog that should be understood as a psychological horror game. It moves in the same direction as Dear Esther, which it may have been an inspiration for, but it did not have such a radical vision underlying its streamlining. (Indeed, as a fully commercial game, it could not have gone there). In this regard, it's funny reading your account because you obviously brutalised a great many of the entities in Silent Hill 2. I did not. I ran away. A lot. It’s a game that doesn’t require you to kill many of its denizens. It isn’t playing the survival card at all. And this is what I think is wrong with your commentary here: it is mostly refuting claims made about Silent Hill 2. I don’t think you’ve let the game itself have its fair share, which is always (in my experience) a problem of trying to appreciate something that others have lauded insuperable praise on. This has certainly destroyed any hope of me enjoying various movies. Yes, the voice acting offers less than might be hoped – but in 2001, what game cannot claim this? (Also, should we not take into account that this is dubbed into English? Many Japanese movies dubbed into English are far more atrocious than this!). I can overlook this the way I overlook the melodramatic gesticulations of the characters in the 1920 Das Cabinet des Dr. Caligari, or the special effects in the 1960s Star Trek – to give two contrasting references that share in common only the extent of their break from convention at their time of origin. Silent Hill 2 shares this same merit: it attempts something far beyond its predecessors or contemporaries. Clearly, the team do not manage to deliver an artwork of comparable magnitude to Dostoyevsky’s Crime and Punishment, which is their chief inspiration, but to even have chosen this as an ambition in a commercial game project in 2001 – when rivals are choosing The Godfather and Aliens as their template because these are, quite frankly, supremely easy influences to synthesise into a string of violent episodes, Silent Hill 2’s decision to construct a game in which violence can (depending on the player’s proclivities) be a tangential part of the experience is significant. This was four years before 2005, the watershed year for artgames, signified by Shadow of the Colossus, Façade, and The Endless Forest. It is amazing to me that Konami allowed Team Silent to go as far as they did from the comfortably well-trod road of mainstream commercial videogames. Sadly, the general response to the game at time of release seems to have echoed your grievances, since by Silent Hill 3 the franchise returns to a far more conventional design – an endless string of combats, stitched together with an attempt at extending the story of the first game. Konami seems to have considered Silent Hill 2 a failure, at least in commercial terms; I persist in viewing it as a flawed triumph. Even now, sexual abuse as a theme rarely appears in commercial games, and (in respect of a different thread of the plot) while you are correct that ‘you are the murderer’ is an overused trope, here the focus is on the guilt brought upon by euthanasia, which is far outside of what we expect commercial games to attempt to deal with. Besides, the pivotal scene in this story occurs not at the climax of the story but in the final conversation with Angela at the burning stairwell in Lakeview hotel. Cut scenes are overused in the games of the 2000s, and most are not worth the expense behind them: this one is rich with a symbolism rarely attempted in games. Perhaps, in your ire at the design, you could not appreciate the successes within the narrative. Regrettably, sharing this viewpoint has delayed my reply to your letter, but I could not stand idly by while you besmirch the name of a game that I still stand by as an early example of the coming willingness to break with the stultifying conventions of commercial videogame development. Written as part of the Republic of Bloggers. All replies welcome. Is Gordon Freeman a Character? Every poll asking gamers to rate the best videogame character is topped by Half-Life's Gordon Freeman. But is Gordon even a character, let alone the best that games have produced? This question hinges upon what we mean by 'character', of course. The argument that Gordon qualifies – despite his lack of a clearly recognisable personality or identity – rests on the assumption that a player-character should be an empty shell for the player to inject themselves into. This is perhaps an expression of the agency aesthetic that valorises choice in games. Trouble is, player-as-Gordon has precious little choice because his world consists solely of puzzles to solve, things to crowbar, or things to kill. So if this is the relevant criterion, it doesn't seem like Gordon has the substance to back up his claim to supremacy with any kind of legitimacy beyond popular mandate. Under this particular criterion, a playable GTA 'character' would seem to have an edge, unless the argument supposes that explicit character traits undermine player agency somehow. But again, this seems to be an argument that player-characters should be blank slates – and on this basis it would seem that a poll of 'best game characters' would be forced to consider supporting cast over lead characters (at least in an idealised perspective on the issue). Either way, Gordon's claim to be a character is weak, and his claim to be 'the best' game character is extremely tenuous. In a 2002 paper, James Newman suggests precisely this kind of 'vacancy' understanding of the player-character in videogames. He suggests that while in active control "the appearance of the player's character is of little or no consequence." Talking of Lara Croft in Tomb Raider games, Newman argues that "in playable game sequences... we don't have to think about her in terms of representational traits and appearance – we don't even have to think about 'her' at all." We've seen this argument before: it's precisely what I have lambasted as fiction denial. I agree with Newman that player-characters under direct player control can be "conceived as capacity - as a set of characteristics", but this is not an admission that these capabilities do not constitute a character. No-one could seriously argue that Indiana Jones whip was not part of his character's identity, nor that Luke's lightsabre is not a part of his. Similarly, as the picture above emphasises, Gordon’s crowbar is a part of his ‘character’, such as it is. Action stories have always allowed the tools and capabilities of their heroes and villains to be conceived under the broad umbrella of 'character', as superhero stories make abundantly clear. As an example to underline this point consider that it would be decidedly out of character for James Bond to escape a jail cell using a paperclip and a piece of cheese, but entirely in-character for MacGyver to do so. Newman suggests that we need to recognise the segmentation of videogames – they comprise of movies, menu screens, maps and so forth just as much as controlled play of a character model. Indeed, Newman is at his most brilliant in his suggestion that we recognise play need not be understood in terms of control. As he specifically observes, players can be engaged with a videogame even when they aren't in control, stating: "The pleasure of videogame play does not simply flow through the lead of a joystick." The trouble is, he then tries to suggest this segmentation can be used to compartmentalise character into sections absent of control, and reduce controlled play to one sensory mode, asserting that "the pleasures of videogame play are not principally visual, but rather kinaesthetic." Graeme Kirkpatrick argues the same – but it's an odd argument upon inspection since it only applies to some types of play and some types of game. The enjoyment of turn-based strategy is not kinaesthetic, and players of Res or Proteus must surely balk at the suggestion that the pleasures they are enjoying are not principally visual – unless, of course, it was to acknowledge how important sound is to these games. The idea that segmentation of content eliminates character from control-based play faces serious issues when it is compared to other media. In an action movie, shall we say the hero only has character in dialogue scenes? That when a stunt person stands in for the actress that her character ceases to be in effect? That in a car chase we are not supposed to imagine the characters are within the car? The urge to reduce videogames to kinaesthetics is a strange kind or reductionism in that it is oblivious to the variety of player experiences, and particularly to imaginative experience. Just as we imagine the character in a film is present throughout the movie, many players imagine the character is present throughout the game – and they are not crazy to do so. This is a perfectly normal way to play a game, and for some players the imaginative experience is far more crucial than the kinaesthetics. That said, the kinaesthetics of play are all too often overlooked, and Newman and Kirkpatrick are an antidote to this blindness – indeed, the latter's aesthetic theory is perfectly suited to fill a gap in our appreciation of videogames as artworks. But only this one particular gap. The imaginative gap of fiction denial needs a different aesthetic theory, something closer to what I present in Imaginary Games. Returning to the question of character, Newman's suggestion that Lara is not a character during controlled play seems implausible if imaginative experience is allowed to constitute play (as surely it must, or else diceless tabletop role-playing games become hard to explain). But his criticism lands squarely on Gordon's geeky shoulders, because Gordon – quite unlike Lara, as it happens – is never really a character in the conventional sense and is only ever his capabilities and a general impression supplied by the box art. (Gainful parallels can be made here with the covers of contemporary fantasy novels). Newman's argument is not as general as he suggests – it applies far less, for instance, to Shenmue's Ryo, whom the player is expected to embody in a far more personal, role-oriented fashion. Even outside of the formal advancement of the story or Ryo's fighting skills, his child-like love of capsule dispensers frequently bleeds into the player's own motives during play. His cry of "I love those!" often becomes mirrored in the player – there is more of a character in this trivial example than at any point in Half-Life! 'Characters' like Gordon Freeman can be understood as cyphers (trivial characters) for the player to imagine themselves inhabiting. This approach to game narrative fits an implied contract of play which favours letting the player act out in the game world however they wish (while practically constrained by the design of the game). But a different contract between game and player – such as that which Yu Suzuki attempted in Shenmue – implies very different notions of character in games. My colleague Ernest Adams recently completed a doctoral thesis, part of which argued for the benefits of an implicit contract between player and game that effectively acknowledges the idea of playing 'in-character'. Concepts such as these could lead to games with much richer player-characters who were far from mere cyphers. They might not knock Gordon off his pedestal, but they'd be far more effective at elevating the artistic status of videogames than any cypher. Could we discover new forms of game narrative if we considered different terms for the relationship between the player and the game? When players sit down to play a tabletop role-playing game, one of the ways of understanding the situation is that there is an implicit contract between the players that sets out their relationship e.g. that the Games Master is in charge, that the players will try to minimize their use of player knowledge etc. Indeed, this was the premise behind the shortest tabletop RPG design ever published, Contract, which I designed with Rob Briggs – the complete game rules fit on the back of the character sheet! Each character sheet is explicitly a contract between the player and the Games Master. The same concept of an implicit contract of play can be applied to videogames. Here the tacit agreement is between the players and the developer or designer - but it has different terms. Often, this contract is assumed to say 'you the player can do whatever you want in our world, but we set the challenges you must complete' or something similar. However, it is plausible that a game could specify a different implicit contract – indeed, there is already considerable variation in the tacit terms. Consider what players are presumed to accept from an MMO, a Free-to-play game, or kart racer as just three simple examples. The implicit contract of Animal Crossing is radically different from that of Grand Theft Auto, even though both are putatively sandboxes. It is possible that by inviting the player to accept a different kind of contract, a game could invite the player to role-play, that is, to play in character (like an actor) instead of acting out (i.e. rampaging across the game world). Imagine how game narrative could be mounted if the player is invited to play as the character they have assumed the role of, rather than expecting to ‘be themselves’ (i.e. be mindlessly destructive because they are casually isolated from the consequences of their fictional actions). This could even be underscored by a scoring or reward mechanism based upon co-operation with the game’s intent, although this would risk overjustification. Assuming the introduction of the new ‘terms and conditions’ could be done elegantly, might this kind of uniquely defined implicit contract of play offer a radically different kind of game narrative? It has long been a commonplace that we can draw a clear line between games as ‘interactive’ media on the one hand, and 'non-interactive' narrative media such as books, television, and movies on the other. Indeed, this distinction is supposedly the reason that ‘videogame’ works as a category. I have long found this segregation misleading because it underestimates the interactivity of supposedly ‘static’ media and it overestimates the agency in most digital games. The assumption behind this division is that the reader of the book or the watcher of a film has nothing to do but receive the content that has been constructed for them. This is not an adequate description of the phenomenology of these media. In fact, both the reader of the book and the watcher of the film are constantly throwing their mind around to interpret the content of the work in question, anticipating what might be about to happen, or reading between the lines and trying to establish details that are not specified by the artwork in question. We seem to view this as ‘non-interactive’ solely because the interaction in question does not have a measurable impact on the fictional world of the story. Yet it does have just such an impact within the head of the reader or viewer, and isn’t this actually the interesting part of our response to any artwork? This creates a problem for the segregation since the vast majority of videogames equally provide interaction that does not have an impact on the fictional world of the game, except from the limited perspective of the player or anyone watching their specific play of that game. Take Halo: Combat Evolved as a simple example. There is one choice that the player can make that affects the story: you can open fire in the starship at the start of the game, bringing the entire story to a premature close. Alternatively, you can co-operate with the story and see it through to its entirely inevitable and pre-scripted conclusion. To take this ability to trigger a ‘false ending’ of the story of Halo as a decisive distinction between different kinds of media would be strange when we can trigger the same kind of false ending in, say Sam Raimi’s Army of Darkness, by selecting an option in the DVD to see deleted scenes and alternative endings. Yet the film is not interactive, the dogma states. I beg to differ. If this film’s DVD isn’t interactive, then neither is Halo, and I am willing to extend this claim as far as a screening of the film itself. What makes Halo the game seem so interactive is that the player has a lot of immediate and shallow agency to affect how they kill lots of alien beings and negotiate a strictly linear sequence of locations. But this is all smoke and mirrors as far as the story is concerned – the player may feel that they are in control, but this is not much different from the way the rider of a ghost train is supposed to feel that they are in danger, even though they clearly are not. I am not against this experience – it is akin, in some ways, to the greater immediacy that rendering a novel as a movie produces. The interactivity of the novel’s ambiguities that originate in the verbal narrative are reduced in the conversion to film because the makers of the movie necessarily instantiate specific interpretative choices that reduce the level of interactivity with the fictional world in question, they make it more static and less dynamic. They make it less interactive, but they cannot render it non-interactive because no artwork could possibly be incapable of interaction and still be worth our attention! I’d like to suggest that it is even possible to add the same kind of shallow agency to a novel or a film as we find in something like Halo. Suppose, for instance, that after each chapter or scene you draw an image that depicts the fictional content in question. You have tremendous apparent agency in how you draw these contents, but you cannot actually change the story by doing so (if you did, you would be playing a different game, something closer to fan fiction). The shallow agency of the reading-and-drawing game played with a novel is just like the shallow agency of Halo – it changes nothing, but gives you a greater sense of engagement with the fictional world in question. To emphasise the idea that the segregation is misleadingly couched as all-or-nothing, consider many early adventure games that were structured as a series of linear puzzles. In these games you have the same shallow agency represented primarily by your ability to type ‘examine’, or your capacity to (seem to) move about the fictional world by typing ‘n’, ‘s’, ‘e’, and ‘w’. Indeed, Matti Karhulahti expressly argues that ‘examine’ can be used to detect a boundary of interactivity, a claim I argue against in “What are we playing with? Role-taking, role-play, and story-play with Tolkien’s Legendarium” (currently under review for the International Journal of Play). But is this enough to mark a segregation as vast as is being attempted? In a novel, we may not be able to shift our purported location by typing a cardinal direction or asking to ‘examine’, but nothing stops us flipping through pages to re-read the description of locations, objects, and characters when we desire the extra information. Why is this not considered interactive, yet the shallow agency of the adventure game is? The point of this invective is simple: segregating videogames from other narrative media forms on the basis of a black-and-white interactive/non-interactive distinction obfuscates the interactive dimensions of supposedly ‘passive’ media and simultaneously valorises the importance of the agency in digital media, which is often incredibly shallow and trivial. The danger lies not only in misjudging the extent that narrative media engages our cognitive faculties but in mistakenly thinking that all kinds of digital game deserve to be treated collectively as a single well-defined category. They do not and cannot. A great many digital game genres are as different from each other as books, TV documentaries, and rock operas are from one another. Could we please stop pretending that the use of computers in play is a more important feature than the range of experiences that the play of media produces? It would be a more honest way to approach the gradations of interactivity that apply to every form of artwork. International Hobo Ltd is proud to announce the publication of Game Writing: Narrative Skills for Videogames, the first reader on the topic of game writing, written by the IGDA Game Writers' Special Interest Group, and edited by ihobo Managing Director, Chris Bateman. A dozen professional game writers each contributed chapters, including Richard Dansky, Mary DeMarle, Matt Entin, Stephen Jacobs, Ed Kuehnel, Tim Langdell, Rhianna Pratchett, Coray Seifert, James Swallow and Andrew S. Walsh, with four chapters contributed by members of International Hobo - Ernest Adams, Richard Boon and Chris Bateman. The book also recieved additional editing from Sande Chen, Wendy Despain, Beth A. Dillon, Ahmad Saad, and indefatigable ihobo troubleshooter Neil Bundy. Game Writing takes a skill focus, and looks at the skills and techniques used by professional game writers in the context of real videogame projects, such as Myst 3, Far Cry, Discworld Noir and Madden NFL Football. Less speculative than most books on the subject of game narrative, this is a book about how the industry currently get stories into games. Anyone interested in learning these skills would do well to pick up a copy. 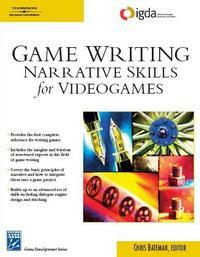 Game Writing: Narrative Skills for Videogames is available from Amazon and all good bookstores. Published by Charles River Media, ISBN 1584504900.